Farmer’s Cheese is a crumbly soft white cheese that made on farms in Europe. It is a sort of pressed version of Cottage Cheese, but a lot dryer. 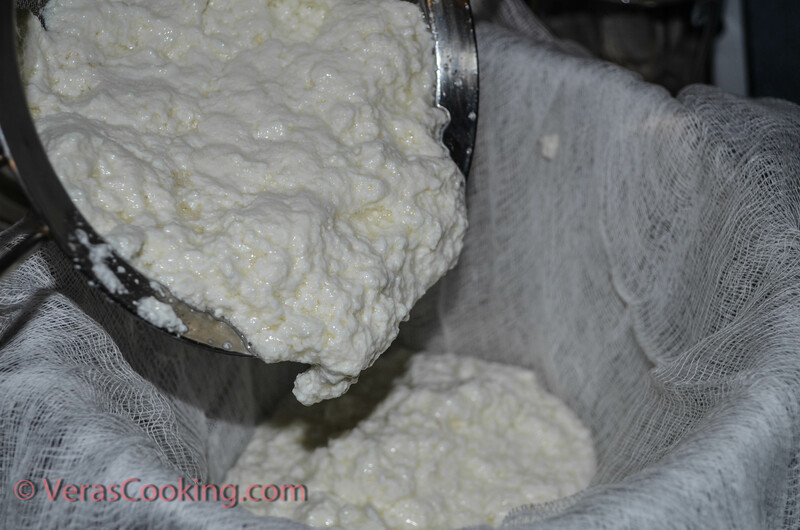 Farmer’s cheese is made by curdling milk with enzyme (found in yogurt or buttermilk), and draining off the whey. Simple as that. Even though Farmer’s Cheese can be found in many European markets in United States, I prefer to make it at home. This way I always have it ready when I need it, and its Fresh! This is a quick version of Farmer’s Cheese Recipe. It is done in 45 minutes! Pour milk and buttermilk in a large pot. Cook on medium heat, stirring occasionally, until the milk starts curdling. Bring to boil. The whole process takes about 30-40 minutes. 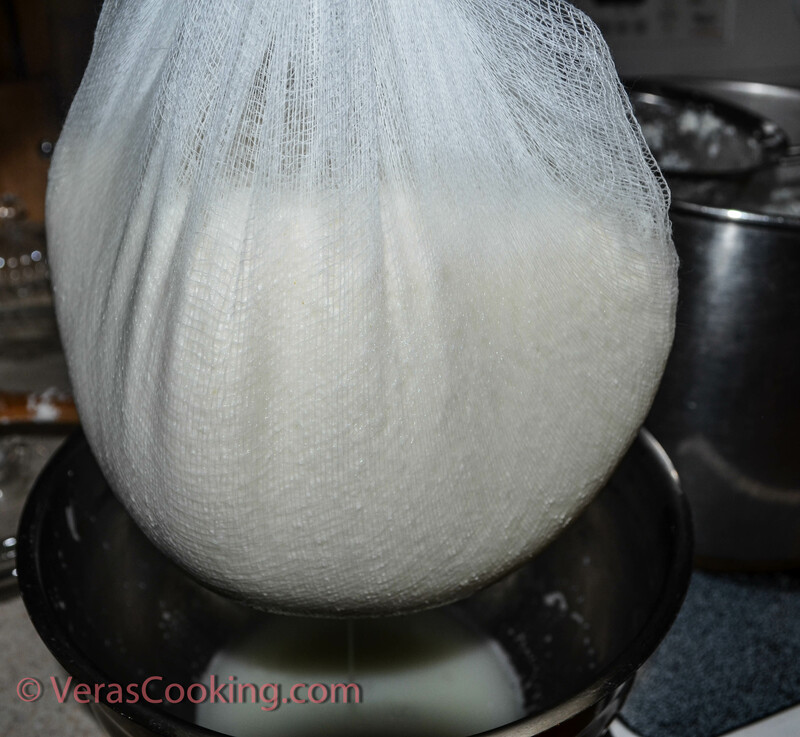 Collect the curds with the strain into 2-3 layered cheese cloth. Let the whey drain. I usually hang the cheesecloth on the handle of my cabinet, and leave it for an hour or so, just because I like my Famer’s Cheese to be dry. 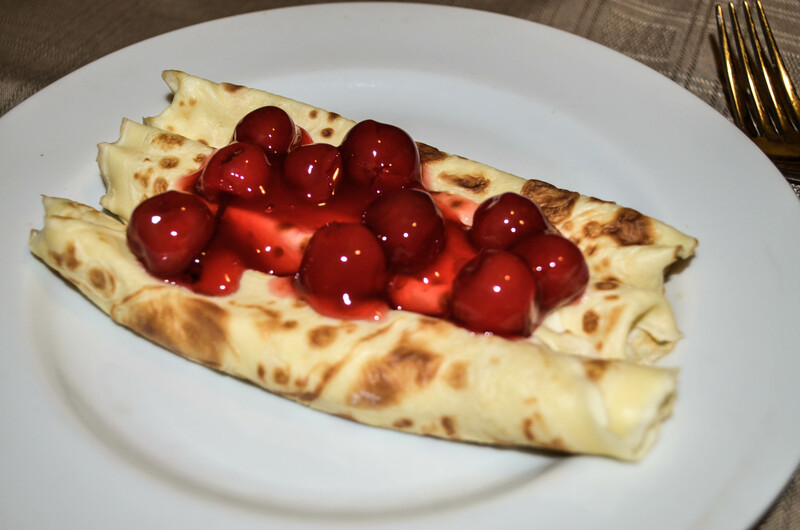 Enjoy making a super tasty filling for Crepes. 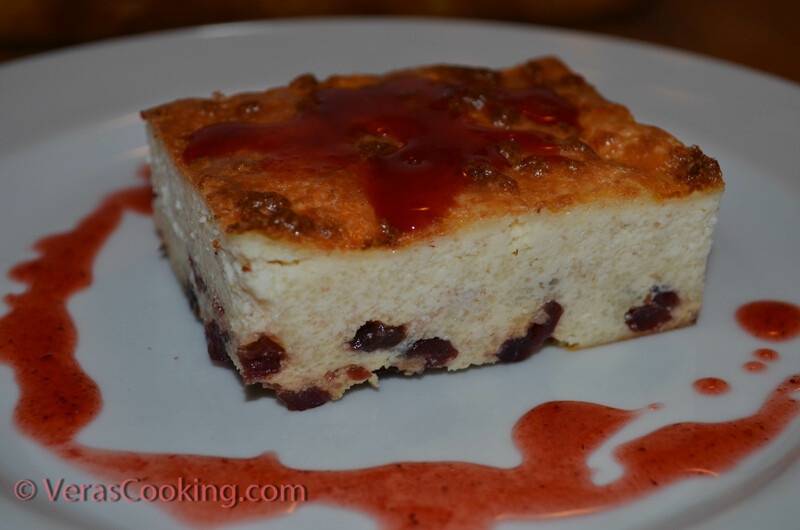 Zapekanka or European Farmer’s Cheese Breakfast Cake is made out of fresh Farmers Cheese. Pour milk and buttermilk in a large pot. Cook on medium heat, stirring occasionally, until the milk starts curdling. Bring to boil. The whole process takes about 30-40 minutes. I usually hang the cheesecloth on the handle of my cabinet, and leave it for an hour or so, just because I like my Famer's Cheese to be dry. Really want to make tvorog using your recipe, you said bring to boil and than turn it off? Or boil for a little? You’re right, bring to boil and turn it off. By the time it boils the curds will gather at the top, which makes very easy to collect it. It worked out so good, super fast!!! Even my mom was amazed, it was my very first time making farmers cheese, although I have to tell you it really needs a little salt and some maybe lemon juice? Otherwise it’s just a very rich and smooth cheese, but not sour or salty at all. Anyways, still like the fast process, will defendantly be making it again! Thanks so much for sharing! Thank you so much for your review. I’m glad you liked the cheese. You can add some salt to the milk. 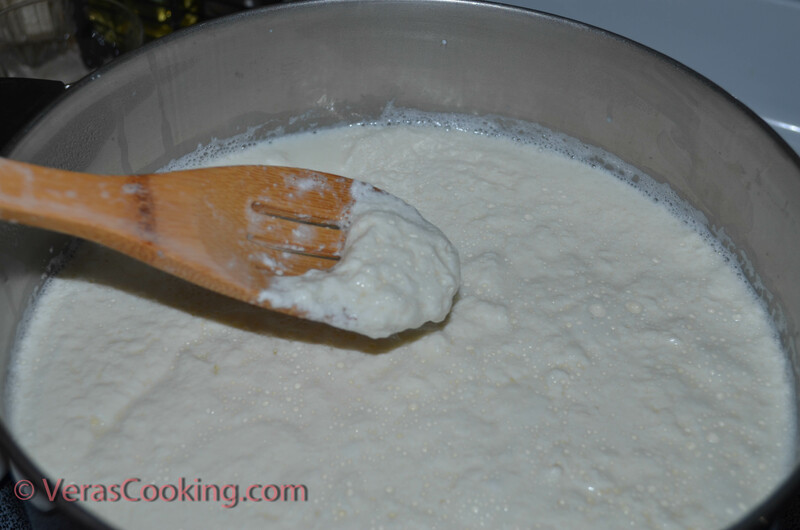 You can also use lemon juice or white vinegar to curd the milk. But the real sour taste of farmer’s cheese can be achieved by leaving milk in a warm place for 2-3 days to form enzyme (good bacteria) by itself. My family prefers it sweet, so this is my favorite method of making it.